One thing about “natural makeup” that I have learned by trial-and-error, SIGH, is that it’s actually better to wear a little bit more shadow, in neutral colors. Wearing less makeup actually made me look more tired, instead of fresh and natural, AS PLANNED. 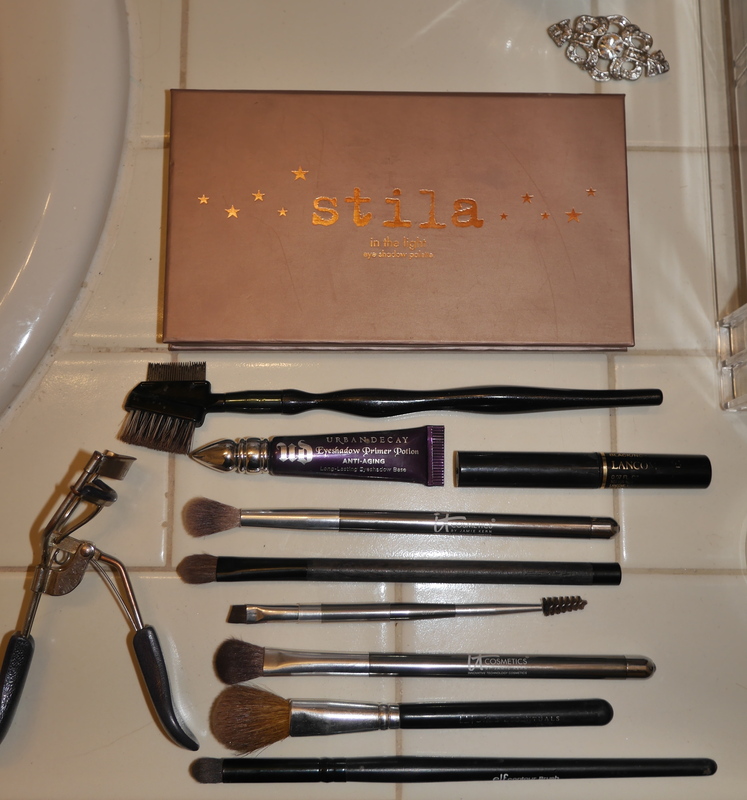 For this post, I’m using the Stila “In The Light” palette, which is really perfect for the neutral shades we’ll need here. It came with a Smudge Stick eyeliner in deep chocolate brown, which is also perfect-o for this look. As you might recall from THIS post, this was my first palette purchase, so this palette has a special place in my heart. Also, $39 might seem like a lot of dollars at first, but to buy all four shades we’ll be using (out of the ten in the set) and an eyeliner from a drugstore won’t be too far behind that $40. It’s an incredible set for quality and value, in my opinion. 5. 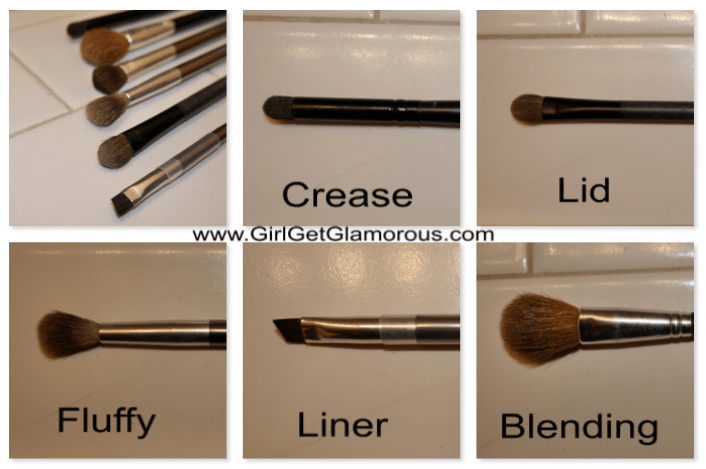 Blending brush from Bare Minerals, part of an old set, you could also use your Fluffy brush again to blend, just make sure it’s clean. 1. Dip your crease brush in the shade “Bliss” and go back and forth gently in the crease of your eye. 2. Using your Lid Brush, dip it in “Bare” and go across your lid, and above the crease shade, to soften the crease shade line. 3. Using your Fluffy brush, tap it in “Kitten” and go underneath the arch of your eyebrow and at the inner corners of your eyes. 4. Take your Liner brush, using “Sandstone” all around your upper eyelid and drawing the edge out into the shape that works best for you. For my eyes, that is a cat eye or “V” shape at the edges of my eyes. 5. Go back in on your under eyes with Sandstone, getting it as close to the eye as possible. 6. Go back over that line under your eye with your crease brush and “Bliss” to soften the lines. This will give your eye makeup a more natural look by softening the deep brown next to your skin, but still have your eyes pop. 7. I like to go back over my crease with “Bliss” to further define my crease and to blend the crease and liner shades at the outer corners of my eyes. 8. Using my eyeliner, I start on the inner bottom lids. It’s easier to line up the eyeliner on the top lids this way. If I start on the top, I usually draw the line too short or too long. 9. Go back over your eyeliner with “Sandstone” to soften the eyeliner line. 10. Lightly blend with a fluffy brush. 11. Curl your lashes, starting at the base with a gentle squeeze, then move up to the middle and ends. 12. Add mascara and you’re finished, pretty ladies! Thank you for reading and watching! Subscribe to my Youtube channel, I post some exclusive videos there for my subscribers. Also, please feel free to share on your Facebook or Twitter pages! Thank you! It’s Revlon lipstick in Jungle Peach. Thank you for the terrific detail on your brushes! I bought several based on your recommendation and they are great! I’m glad it helped! I feel like brushes make a huge difference in how my makeup comes out. Which ones did you get?